Bombardier’s airplane divisions certainly struggled through a challenging year in 2014. Programs such as the midsize Learjet 85 were delayed, the CSeries flight test program, now back in the air, was grounded following an engine failure, and plans to build Q400 turboprops in Russia are currently stalled. Program delays, in addition to burning through cash, have had the unintended consequence of four test programs bunched together over the next 18 months as Bombardier readies the CSeries, ultra-long range Global 7000 and 8000 business jets, and the Lear 85 for market. At NBAA 2014 in Orlando, Bombardier also launched the Challenger 650 (formerly referred to as the Challenger 605 “NG”), essentially an avionics, interior and engine upgrade of the large cabin. Deliveries of the aircraft to launch customer NetJets are scheduled to begin this year. It is not that 2014 was a complete write-off for Bombardier. Aerospace revenues were up in the third-quarter due in part to higher levels of deliveries of regional jets and large cabin business jets. The company inked a firm order for 40 of the larger CS300s by Macquire AirFinance, a Dublin-Ireland-based aircraft leasing company, and it had a strong performance at last year’s Farnborough Air Show, despite not being able to showcase the CSeries. Farnborough and Paris are not just where airplane builders like to generate industry buzz by fattening their order books. It is where new airplane programs are launched and launched airplanes are debuted. It was the 2008 edition of Farnborough where Bombardier, pioneer of the regional jet concept officially took the wraps of the CSeries family of airliners, still considered the best airplane for the 110- to 130-seat category. The world’s third-largest civil airframer and 15th biggest aerospace company overall needs to pocket a win in 2015, but nobody is predicting whether that will be the long-delayed commercial launch of the clean-sheet CSeries – or even who the launch customer might be. Last summer, Bombardier streamlined its corporate structure, eliminating the layer of Bombardier Aerospace, and breaking the company into four groups: transportation (trains); business aircraft; commercial aircraft; and, aerostructures and engineering services, specializing in third-party design and development of complex advanced composite and metallic structures for civil airplanes. Guy Hatchley, the chief operating officer of Bombardier Aerospace and face of the CSeries, is out along with Philippe Poutissou, head of commercial aircraft marketing. Mike Arcamone and Eric Martel remain heads of commercial aircraft and business aircraft respectively. The changes came into effect January 1, and are expected to save Bombardier about $250 million annually. The restructuring triggered immediate speculation that Bombardier might be shopping its commercial division around, the most obvious candidate being China’s Comac, which Bombardier entered into a technology sharing agreement with in 2012. Comac has a built-in market to challenge the Airbus and Boeing duopoly. Like Bombardier, which has wrestled with bringing complex, first-time new technologies to market with the CSeries, Comac has struggled with its two commercial airliner programs, the ARJ regional jet and 158- to 174-seat C919. The first C919 prototype has reached final assembly and the aircraft should be ready for flight-testing in late 2015 or early 2016. Unlike Bombardier, the Chinese airframer has no global support network or expertise in certification. A merger or equity stake would give Comac overnight access to Bombardier’s engineering know-how and supply chains while pumping needed cash and opening a customer base for the slow-selling CSeries. 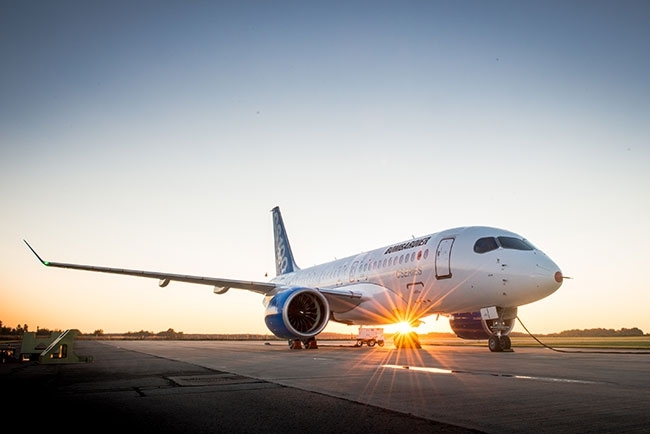 Test-flights for the CSeries resumed on September 7, following an on-ground engine fire on the first test aircraft, FTV1 at the Mirabel facility in May. Bombardier played down the incident as flight test vehicle two (FTV2) took off. “Aircraft flight test programs are complex and involve extreme testing meant to draw out any potential issues and correct them prior to entry-into-service,” said Rob Dewar, vice president of the CSeries program. A fourth test vehicle has been logging hours at the Bombardier facility in Wichita, Kansas and a fifth aircraft will join the test program early this year. Meanwhile, the company has embarked on an aggressive sales tour in the U.S., largely using Wichita-based FTV4. In October, FTV4 made stops at the American Airlines base at Dallas-Fort Worth and Indianapolis, headquarters of Republic Airways, a launch customer for the larger CSeries-300. The Republic order of 40 aircraft plus options has been on soft ground since the company off-loaded its Frontier Airlines unit. The operator is changing its business model to a point where the CSeries may no longer be a good fit. Some analysts believe a cancellation has already been baked in to Bombardier’s projections and that the airframer should be able to fill Republic’s slots. Bombardier’s order book stands at 563 commitments for the CS100 and CS300 aircraft, including 243 firm orders from 14 customers. Not enough to support a production line of 120 aircraft per year once the airplane enters service, but as David Tyerman, an analyst with Canaccord Genuity, told Wings in an earlier interview, the company has a strong track record in turning letter of intent into orders. Customers include Lufthansa, Ilyushin Finance, a Russia-based aircraft leasing company, and Odyssey Airlines, a U.K.-based paper airline that plans to launch CS300 services across the Atlantic from London’s City Centre airport. Missing is the CS100’s launch customer. Swedish regional carrier Malmö Aviation was thought to the CS100’s launch airline, but pulled away citing concerns over delays. A Bombardier spokesperson told the Wall Street Journal that Malmö’s roll as launch customer “was never signed or set in stone” and several other airlines are reported to be interested in becoming first out of the gate, including Swiss Airlines International, a Lufthansa subsidiary. In late December, Bombardier announced a CSeries launch customer was confirmed, though it was not identified. Beaudoin remains confident that first customers will begin taking delivery of the CSeries in the second half of 2015. But the program has to clear a number of hurdles first. To date, Bombardier has completed more than 450 hours of the 2,500 hours required for certification. “The airplane, through the downtime in the summer, has matured a lot,” Beaudoin said. “Since we got back [in the air] in September – because of various upgrades – we really were flying with a plane and a half. We did more than 120 hours. As we get the four airplanes back in flight you will see that the hours per month will increase substantially. Even so, 2016 still appears to be a more likely entry-into-service-date, which means that the airplane will continue to be a drag on revenue for the next 12 months. The manufacturer is certain to cut the ribbon on the CSeries assembly line in 2015. Expect the CSeries to drive attention in the year ahead. There are indicators that Bombardier is positioned to consolidate some positive gains throughout 2015. Final assembly is underway on the Global 7000 business jet, which is expected to begin test flights this year for an entry-into-service in 2016. The Global 8000, the world’s longest-range business jet, is close behind. Bombardier is strongly committed to the all-composite Lear 85 but will not commit to an entry-into-service date, although it is clear that first customer deliveries have dropped behind the new Globals. Demand for the CRJ900 and CRJ900 regional jets appears to have breathed new life into the CRJ production line, which has slowed in recent years. Bombardier has firm orders for 359 of the 76-seat regional jet including Delta, the American Airlines Group, Lufthansa City Express and China Express Airlines. The Q400 turboprop continues to lose market share to rival ATR and plans to open an assembly line in Russia as part of a 100 aircraft deal (including 50 options) with Ilyushin Finance and Rostec, a state-owned industrial and defence conglomerate has been iced by the current political crisis. Russia remains a critical market for Bombardier and the company still sees potential for the Q400, and may revisit the assembly line later this year. All in all, it appears to be an intriguing year ahead for Bombardier now that the “reset” button has been pushed.